In the Old Testament, sacred objects, sacred people, and sacred places would aid and mediate on behalf of the people to enter the Holy of Holies. By entering the Holy of Holies, they would receive a special blessing and purification for their sins. READ HEBREWS 9-10 – pay attention to the different sacred objects, sacred place, and sacred people. Throughout Southeast Asia, we can discover many people with a similar mindset and worldview. Sometimes the special “blessing” means having a healthy baby. 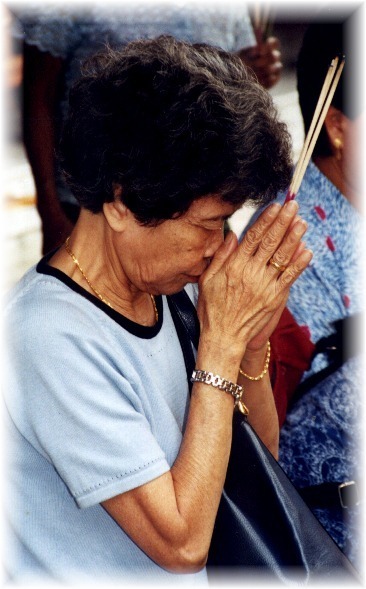 So women go the temple and show respect to Guan Yin, the goddess of mercy. Sometimes the special “blessing” means having a better and a wealthier life. So Hokkien Chinese businessmen will show respect to Guan Gong, the god of war. 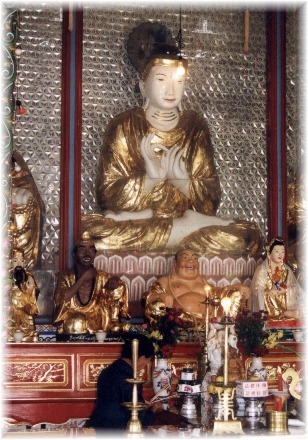 No matter what special blessing they desire, the sacred realm is viewed as offering a better life. They recognize that without the aid of sacred objects they are inadequate and incapable of entering the sacred realm and receiving a special blessing. In addition, they recognize that without the aid of sacred places or sacred people they are unable to enter the sacred realm and receive a blessing. In other words, they recognize that there is a dividing gulf between the secular and sacred realms. Christians would call this dividing gulf sin or the awareness of missing the mark or an awareness of falling short of the glory of God. 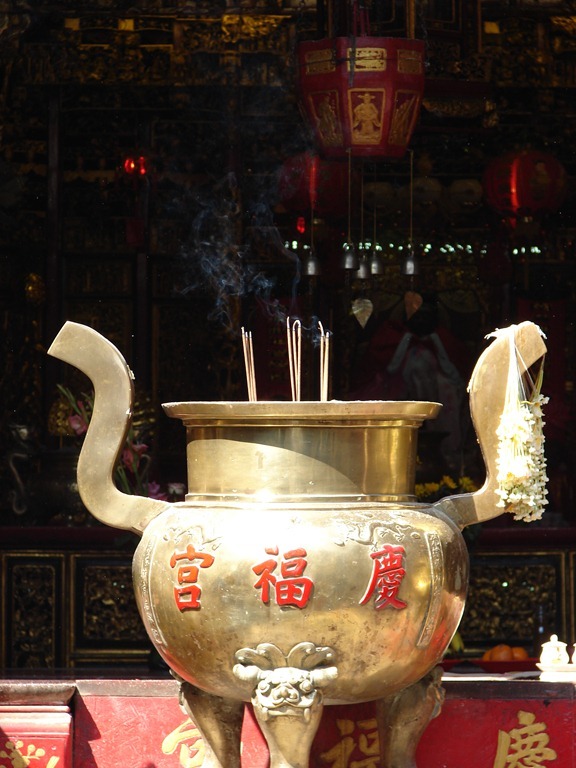 On the other hand, sacred objects, along with sacred people and sacred places, mediate on their behalf to enter the sacred realm in order to receive a special blessing. 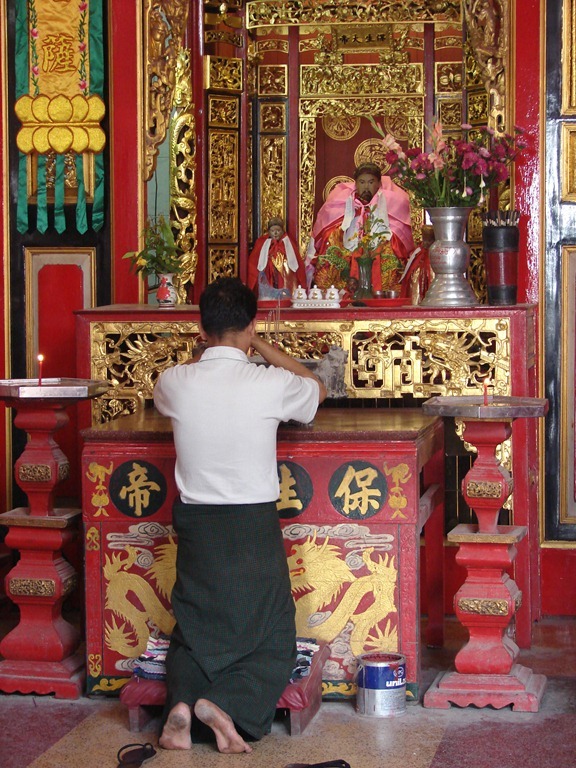 For instance, when Chinese go to a temple, which is a sacred place in their eyes, they will stop at the threshold or doorway and worship (bai bai) (a lady seen to the left at the threshold of entering the temple) facing both toward the inward part of the temple and facing toward the outside of the temple. 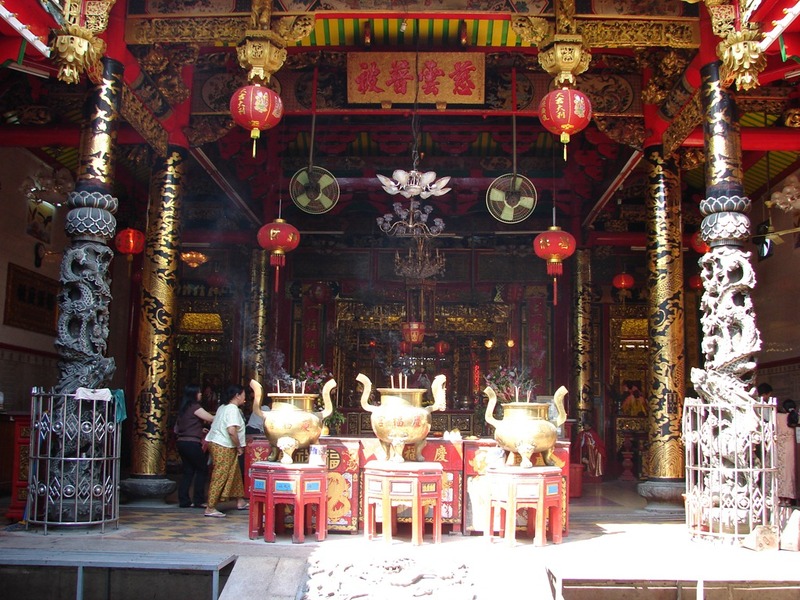 In the temple, they will use many different sacred objects to help them enter further into the sacred realm. One such object looks like two small kidneys. They will take the small like kidney objects and throw them on the ground expecting to receive a special answer and blessing from the sacred realm. Oftentimes, they will look to certain people to aid them in entering deeper into the sacred realm and receiving a special blessing. Sometimes that person will be a monk and on other occasions a mediator. Throughout Southeast Asia, we can discover many people with a similar mindset and worldview. But, Southeast Asia is not the only place that we find such a mindset and worldview. The people of the Old Testament had a similar worldview and mindset. They believed that sacred objects, sacred people, and sacred places would aid them and mediate on their behalf to enter the Holy of Holies. By entering the Holy of Holies or sacred realm, they could receive a special blessing and purification for their sins. Previous PostSacred Objects, Places, and People (Part 3 of 3) . . .Next PostThe Things People Eat . . .